Laura Christensen has developed a practice of painting on recovered vintage portraits. Also a woodworker, she constructs small shadow box frames and miniature cabinets to present the altered photographs. Her work has been featured in galleries and museums, including Kidspace at MASS MoCA, Tweed Museum of Art, Bennington Museum, and Simmons College. She recently won her second Artists’ Resource Trust (A.R.T.) 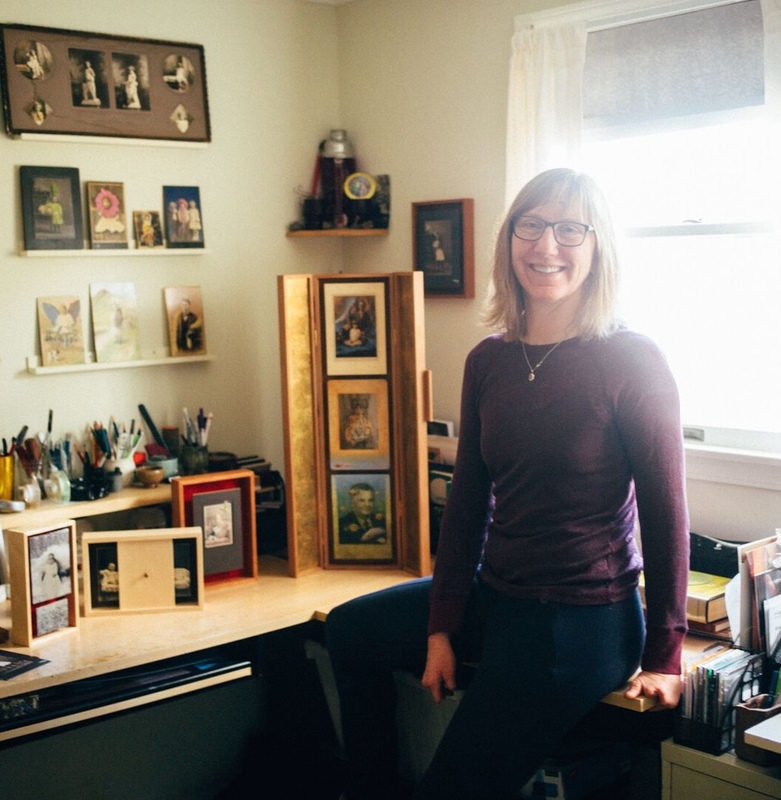 Grant, a fund of the Berkshire Taconic Community Foundation in support of her upcoming book project, THEN AGAIN: Vintage Photography Reimagined by One Artist and Thirty Writers available on Kickstarter now! Vintage photographs are the basis of my art. They serve as a physical foundation, a canvas for my painting, and they inspire my art. Like family and friends of the depicted, I pay extraordinary attention to each photograph, yet with a different eye. By the time I find them, the original chains of personal connection have broken. The object-ness and formal qualities are easier to see. Subjects are freed to become characters cast and costumed, players in another story that forms fresh bonds with new audiences. Working within confines and possibilities of each photographic object, I paint to cancel parts of images and conjure new illusions. I create a seamless image that combines past and present, photograph and painting. Apparitions of those who posed for a camera are still visible, but transformed, and performing fresh scenes of pathos and humor. Handcrafted cabinets serve as proscenium for their stage.